Pink Panther Video Slot Guide & Review - Casino Answers! Pink Panther is a 5-reel, 40-line video slot developed by Playtech, featuring wild symbols, scatter wins, free spins, multipliers, expanding wilds, a gamble feature, five bonus games and two progressive jackpots. You can play the Pink Panther video slot at Playtech casinos including Windows Casino and Cameo Casino. To play the Pink Panther video slot, set your coin value at $0.01, $0.05, $0.10, $0.25, $0.50, $1, $2 and $5. Then, you can set the bet per line at 1-10 coins and your number of selected paylines anywhere from 1 to 40, a number larger than almost all video slots. The lowest total bet you can make on the Pink Panther video slot is $0.01, with the highest being a gigantic $2000. Hit the “Bet Max” button to play all 40 lines and all 10 coins or use “Spin” to play with your own wager. There are autoplay and skill stop features on the Pink Panther video slot. To win the 5000 coin top fixed jackpot on the Pink Panther video slot, you must hit 5 Pink Panther wild symbols on a selected payline. 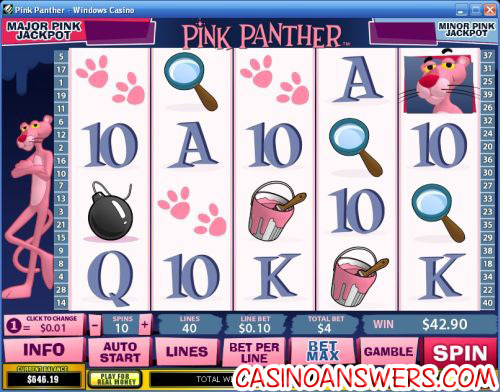 The Pink Panther symbol is the wild symbol and will substitute for all non-scatter symbols in the slot game. The main feature on the Pink Panther slot game is the Pink-Pow bonus feature. The Pink Panther randomly blows up between 2 to 6 symbols on the reels, turning them into wilds. A random wild symbol substitutes for all symbols except for scatter symbols. Scatter wins are paid before random wilds are distributed. The Pink Panther slot game has two progressive jackpots – Minor Pink and Major Pink. They are triggered randomly in the regular slot game. Any spin of any amount in the slot game can win entry to the Jackpot Game, including losing spins. However, you can increase your chances of triggering the Jackpot Game with a higher bet. Entering the Jackpot Game guarantees a win of one of the two jackpots or the fixed consolation prize. In the Jackpot Game, there will be 12 doors. You must open doors to reveal characters. If you open 5 Pink Panther doors, you will win the Major Pink Jackpot. Opening 4 Pink Panther doors will win you the Minor Pink Jackpot. If you open 3 Little Man doors, you will receive the fixed consolation prize. The Jackpot Game has a reaction timer that will cause a jackpot to be paid out if you do not react in time (and we have a funny feeling it will be the consolation prize, so stay sharp!). In randomly triggered The Color Pink bonus game, the Pink Panther and Little Man paint a wall of numbers in pink and blue respectively. The pink numbers will be added up as the cash prize. After a round of painting ends, you may choose to accept your prize or to try again (up to 3 rounds). If you reach the third round, the prize will be collected and you will return to the regular slot game. The fourth randomly triggered bonus game in the Pink Panther slot game is the Wheel of Pink bonus game. In the game, Pink Panther will spin two wheels. The outside wheel will win a cash prize, while the inside wheel will determine whether you play again (re-spin) or the game ends (collect). Finally, the last bonus game on the Pink Panther casino game is the Pink Trail bonus game. Inspector Closeau follows footsteps for four rounds to find the stolen diamond. Each footstep will award you a cash prize. The number of footsteps is random. At the end of each round, you can either continue playing or collect the prize. If you continue playing, you will risk a trap that will cut your winnings in half and end the game. If you complete all four rounds, Inspector Closeau will find the missing diamond and your bonus game prize will be doubled. 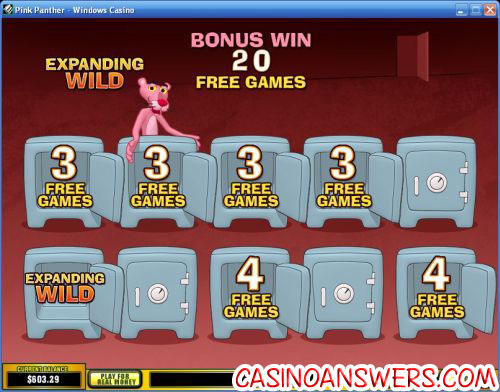 On any win you get on the Pink Panther slot machine, you can choose the “Gamble” button to activate the gamble feature. There will be a row of five facedown cards on the screen. The card at the far left will be the dealer’s card. Your goal is to pick a higher card. You can either gamble your entire win to double your winnings or gamble half your win to double half of your winnings. You can also hit the “Collect” button to back out of the gamble feature at any time. Each Playtech casino has its own double up limit, which in the case of Windows Casino is $5000. We at Casino Answers feel that when most people are looking for a video slot, they are looking for one that they can win a lot of money at, that has a lot of play value and has a theme they enjoy. Pink Panther is packed with so many special features that it is quite frankly ridiculous. The Pink Panther video slot is no doubt one of the best Playtech video slots (and if you’ve ever played at a Playtech casino, you will understand how that’s saying something). To play the Pink Panther video slot, sign up and make your deposit today at Windows Casino! Are USA players able to play the Pink Panther slot on real money mode? Unfortunately, USA-based slots players will have to miss out on the Pink Panther slot game for the time being. For a USA-friendly online casino with tons of great slots including interactive ones, check out This is Vegas Casino! How do I win a Pink Panther progressive jackpot? To win one of the Pink Panther slot’s progressive jackpots (Minor Pink and Major Pink), all you have to do is play! Any spin you make can win. However, Casino Answers does recommend that you bet higher to increase your chances of winning. Good luck! How do I trigger one of the Pink Panther slot machine’s bonus games? The Pink Panther’s bonus games are triggered randomly, like the progressive jackpots. All you have to do is play and we are sure that within a few spins, you will be playing the Color Pink, Pink Trail, Wheel of Pink, Crack the Pink Code or (hopefully) the Jackpot Adventure bonus games. Is there a pink panther casino game?